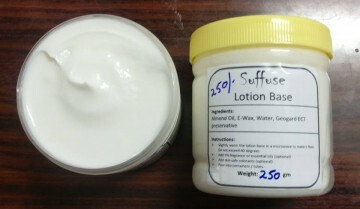 Quick absorbing, light weight lotion base available. Just add fragrance /essential oils and colorants (optional) and the lotion is ready to use. Can be used as a face and body lotion. Suitable for all skin types. Oil (of your choice) , Emulsifier (EWax), purified water, paraben-free preservative.